Until the Meiji Restoration, consumption of beef had been banned in Japan for about a thousand years! This reflected not only Buddhist cultural prejudices, but to keep penalties severe in case anyone was tempted to slaughter drought animals (i.e. for pulling things) during a famine. Individually, a Wagyu (lit. “Japanese cow”) was more valuable than a Japanese peasant. It’s just a matter of muscle power and economics. After the Meiji Restoration, Wagyu were mixed with Western types of cattle to some degree to improve their beefiness (no, really – to make them better for beef consumption) among other advantages. 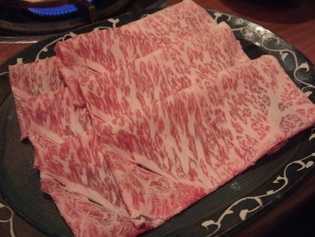 However, what made the “Kobe beef” different was that these cows were seriously pampered: each cow is meticulously back massaged by animal handlers to improve the quality of the meat and, critically, the distribution of the fat, creating a marbling effect as seen in the picture at the top of this post. Kobe beef fat has a lower melting point than that of normal beef. You actually can’t make Kobe beef “well-done” without extracting all the fat in it, which defeats the purpose. The fat’s melting point is actually low enough that it literally melts in the mouth. This goes along with just plain tender meat that is considered by one list to be the fourth most expensive luxury food in the world, exceeded only by white truffles, saffron, and at the top, caviar. 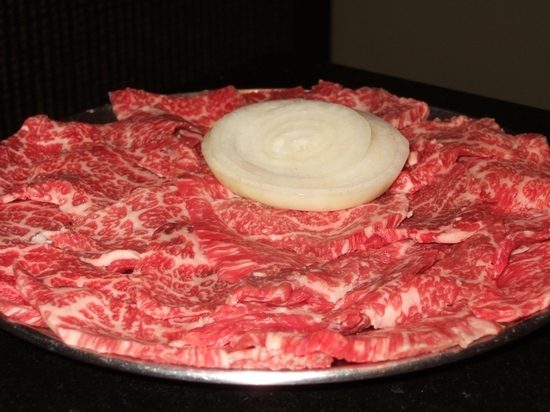 I didn’t know much about Kobe beef until seeing a mention in the media. When I told a friend about it, he explained to me that he has personally tried Kobe beef, and it is indeed incredible. He also said it is much superior to a type of meat that goes around under the moniker of Kobe-style beef, which is American raised. “Kobe-style beef” is a third of the price and is still good meat, but the cows aren’t given that “fancy Japanese massage stuff” that produces “largely cosmetic changes.” Yes, but those changes are important factors in the final product. As a translator, I always said that the final 5% of quality makes a huge difference in the overall quality of the final result. It’s true for beef, too. 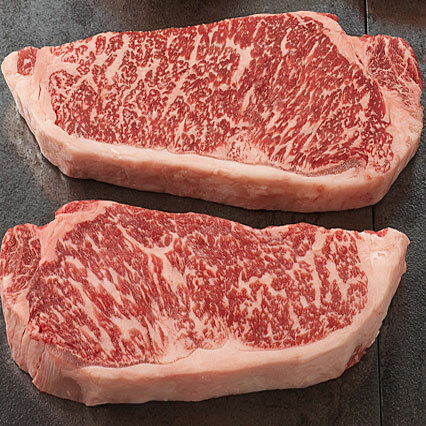 The cows for “Kobe-style beef” are cross-breeds between Wagyu and the typical Angus. Due to the cost benefits, Japanese people were eating quite a bit of this at one time, because Kobe beef could be $300 US (that is, per pound) in Japan. A third of that is still a wallet-bursting $100 a pound. Now, a while back, we had Japanese producers shipping their cows to the United States, having them fed grain and massaged according to exacting Kobe standards, and then shipping them back to Japan to be slaughtered. Grain and land are a lot cheaper to come by in the US, of course. In both cases, this came to a crashing stop eventually. While the “traditionalists” in Kobe beef likely rejoiced at the downfall of their competition, there was a very real reason at work, too. Mad cow disease, usually known as BSE (an abbreviation of a far too long scientific name), caused Japan to shut its doors to all beef from American soil, whether Kobe style or not. After all, any cross-herd contamination wouldn’t care whether the cows are “genuine” Wagyu, Wagyu-Angus, or anything else. It’s a terrible disease that destroys the brain and which isn’t even caused by a virus or bacteria, meaning that conventional methods simply cannot fight it. If you get it, sooner or later, it’s over for you. Although at any rate, Kobe beef is not cooked to be “well-done,” since it’s not a bacteria, cooking contaminated meat to that level isn’t going to help. It’s essentially a protein gone wrong that throws the body for a loop. Very sad stuff to read about. So, the Japanese government did have a legitimate reason, even though I’m sure American producers felt like the response was dramatically overdone. Losing lots of money will do that. Actually, Japan no longer has a total ban on imported beef, but the cows have to be slaughtered 20 months and under. Since “Kobe beef” cows are slaughtered between 26 and 32 months, American “Kobe beef” is completely banned. While I’m sure there is some scientific justification, that’s an awfully convenient coincidence for entrenched interests in Japan, isn’t it? The thing you have to remember is, only “Kobe beef” is actually Kobe beef. “Wagyu beef” is just beef from a Japanese cow. 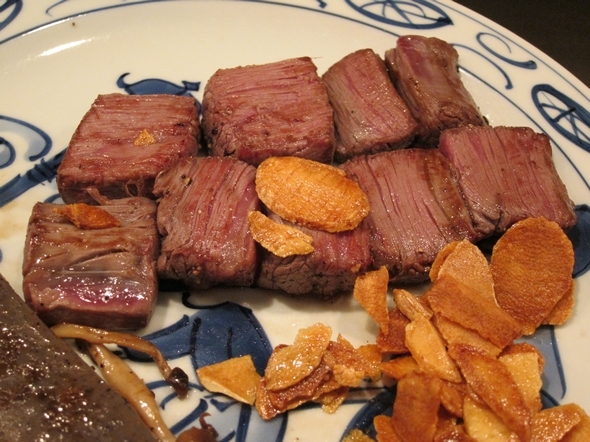 An example of a Wagyu beef brand is Miyazaki Wagyu. The cattle are given individual names, are given pure grain feed (i.e. none of that recycled animal remains stuff!!! ), and are completely free of growth hormones and implants. (I think they receive antibiotics when necessary, and that’s all, so it sounds pretty organic to me.) But Miyazaki Wagyu and Kobe beef are apples and oranges, so to speak. This entry was posted in Culture, Japan and tagged beef, culture, food, Japan, Kobe, Wagyu. Bookmark the permalink.